The Hosta Queen Quilt Mixer layout includes 6 distinct groups to create an 100” x 100” quilt. The components include a Leaf Center, a Leaf Border, a Clamshell Background, a Clamshell Border, a Swag Border, and an Outside Border. Quiltworx.com has designed a series of paper-pieced blocks that can be mixed and matched in each of these areas to create a quilt that is unique to you. When you click on the buy now button, each of the paper-pieced blocks will be listed separately for you to purchase only the ones you want to use. Please note that you will need to purchase the Hosta Wall Quilt Introduction booklet as well! However, if you are making a second mixer and already have the introduction, you will not need to purchase it again. To design the layout for your individualized quilt, you have likely already utilized Quiltster, which is a fabric auditioning and design enhancement application. It is available on a monthly or annual subscription basis that allows quilters to play with pre-designed blocks and current fabric collections to find their favorite combination before purchasing the foundation papers and fabrics for their quilt. 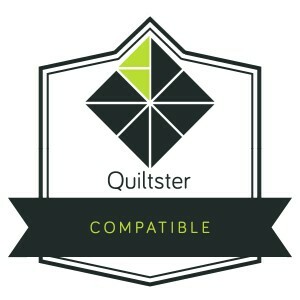 If you have not used Quiltster, I would encourage you to check it out before purchasing any units! Without Quiltster, you will not have yardage information for the entire quilt, nor will you know what your quilt will look like before you start making it! A link to the Template in Quiltster for this project is provided below. Click on the Hosta Queen Mixer Template to get started! Sorry, there are no classes scheduled for Hosta Queen Mixer at this time.